The 1909 Philadelphia Caramel Baseball Card Set (E95) consists of 25 cards that measure 1½" by 2¾". Often referred to as E95, the cards were included with caramel candies manufactured by the Philadelphia Caramel Co. of Camden, New Jersey. The 1909 Philadelphia Caramel baseball cards have a checklist in black ink on the back, listing the 25 players included in the set. The 9 future Hall-of-Famers in the E95 set are: Chief Bender, Frank Chance, Ty Cobb, Eddie Collins, Sam Crawford, Johnny Evers, Eddie Plank, Honus Wagner and Vic Willis. 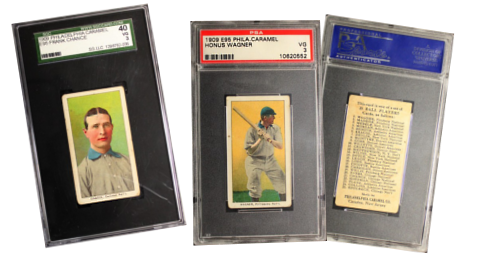 CLICK HERE if you want to sell your 1909 E95 Philadelphia Caramel Baseball Cards.